Unlike in Indonesia or Singapore, eggplants are not always available everyday or every season in Germany supermarket. This week they were available in supermarket, so I bought one piece of it. At that time I still could not figure out what to cook with this eggplant. Then I visited Pinterest to find pictures or ideas of eggplant dishes. I found some pictures of eggplant pizzas. They were so colorful and looked delicious. Hence, that day I cooked eggplant pizza. It was delicious and very easy to prepare. I used some left-over ingredients from my fridge such as olives, cherry tomatoes, and cheese. To make this dish, you just need a small oven or at least a mini oven toaster. Line a pan (or more, depend on the size of your pan) with parchment paper. Arrange the sliced eggplant on the pan and season with salt, pepper and garlic powder. Bake for around 15-20 minutes. Spread tomato paste on top surface of each baked eggplant and top with sliced olives, onion, cherry cut tomatoes and cheese. It is better served warm. You can add other ingredients that you like, such as ham, bacon or sausages. Do not hesitate to put generous amount of them. 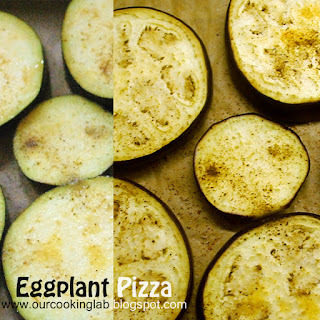 The limit for the topping of your pizza is as long as the eggplant can contain them. 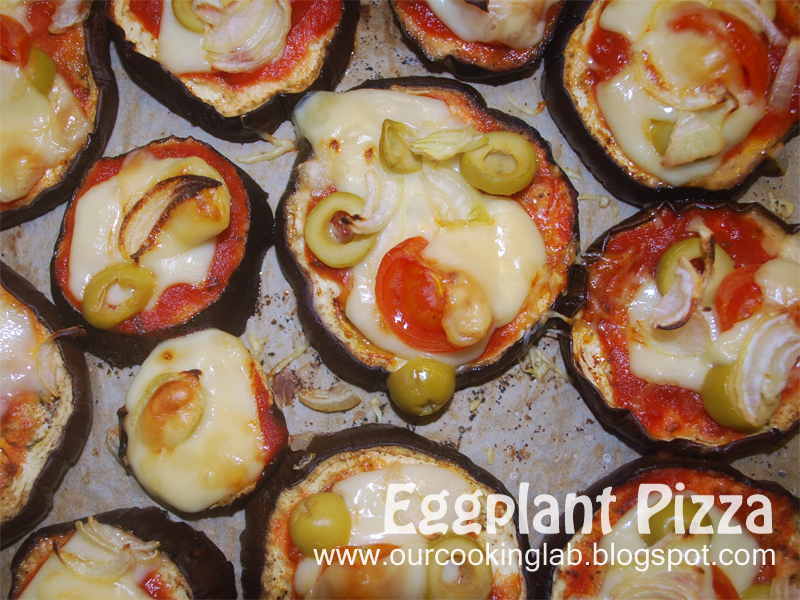 I love this eggplant pizza, especially when it is served warm (like any other pizza). Although the total cooking time is long, I didn't really need to spend time paying attention on cooking process. Once the pan was in the oven, I just relied on oven timer to do its job and I could continue to do other activities. Back in my home in Indonesia, eggplant is normally cooked in traditional ways like eggplant with coconut milk and tomatoes, rica rodo (Minahasan style), or even in sour eggplant soup as a compliment of popeda (it is a native Maluku dish made of sago powder). Cooking and eating eggplant pizza is definitely are new experiences for me.